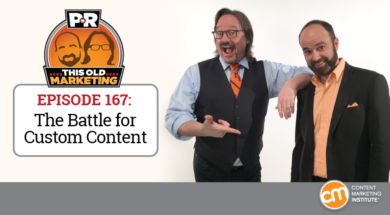 In this episode, Robert and I discuss the ongoing battle among publishers, agencies, and brands to dominate the content space and gain audience mindshare. In other news, while The New York Times releases its annual health report, we define the true role of the journalist. We share rants and raves on commitment and climate change; then we close out the episode with a missed content marketing opportunity in our example of the week. The battle for custom content keeps heating up (08:15): In a new video blog post, AdAge offers its perspective on whether agencies or publishers will emerge as the dominating force in the custom content space. And, in a follow-up article, AdAge lends support to the publisher side of the argument by outlining global marketing consultancy R3’s annual M&A report, which contends that publishers acquiring agencies was, perhaps, the biggest marketing business trend to emerge over the past year. While I’m surprised that AdAge took so long to enter this conversation, I’m hoping this will be the shot in the arm that agencies need to start accepting that building an audience is the key to content success. We also discuss what could be blocking brands from making their own inroads to become the media that serves their niche. The New York Times sets its digital path forward (22:48): On its NeimanLab website, Harvard University’s foundation for promoting and elevating the standards of journalism offers a thorough analysis of The New York Times’ recently released multimedia publication: Journalism That Stands Apart: The Report of the 2020 Group. Among the points Robert and I debate are whether The New York Times intends to continue relying on paid subscriptions as the linchpin of its business model, whether it’s realistic for publishers to expect its content creators to be adept at web coding, and ways the publication might be able to continually evolve and differentiate its content. Robert’s rave: Robert gives big props to Adam Kleinberg, CEO of San Francisco-based agency Traction, for his thoughtful – and completely spot-on – editorial recently published on Adweek. Robert views the piece, which runs through what it really takes for agencies to achieve success with content marketing, as a strong step toward educating this community and ensuring that they are prepared to walk the walk when making a commitment to the discipline. Joe’s rave: I recently caught an episode of the Tim Ferriss Show, which featured Arnold Schwarzenegger. In it, the former governor of California criticizes environmentalists for communicating on the issue of “climate change” in terms of its future probabilities rather than focusing on “pollution,” which is a current and dangerous reality. I think this is something content marketers can certainly relate to – and should be cognizant of. If your content isn’t achieving its goals, consider the possibility that you are hitting the right mark with your content, but just need to find different words to inspire and activate your target audience. The People’s Choice Awards took place this past week. The televised ceremony has been around for many years; but what you may not know is that the event is not a Hollywood industry construct – it is fully owned by Procter & Gamble, and has served as a content marketing platform for the company since 1982. In fact, ads aired during the show have always been exclusively for P&G brands, though the company has started to introduce non-competitive brands into the mix as an additional revenue stream over the last few years. 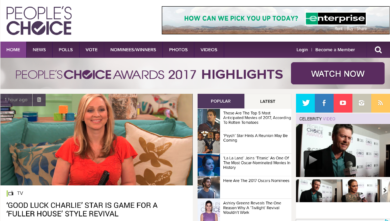 With this in mind, Robert decided to dig a little deeper into the People’s Choice Awards digital channel, and found it to be a wonderful content hub for all things related to entertainment. The site features editorial coverage of entertainment news, as well as polls, surveys, video clips, a subscriber newsletter, and more. The site also sells advertising. However, when he went looking for P&G ads, Robert made a fascinating discovery: It seems that the mobile, social, and web experiences are owned by the company to which P&G outsources production of the televised show – Mark Burnett & Hearst Integrated Media. And it’s one of that company’s properties – One Three Media – that controls the website. So regardless of the website’s strengths as a content marketing vehicle, in our minds P&G is missing a huge marketing opportunity by failing to integrate the TV and digital channels for this entertainment brand or to take advantage of year-round consumer interest in the awards show.